Priority Registration is for currently enrolled students only. All other students can participate in Open Registration. Students participating in Priority Registration will receive a scheduled registration time several weeks in advance to the beginning of Priority Registration. Students are required to meet all financial obligations prior to registration. Currently enrolled graduate students may begin to register for classes any time after 8:00am on the first day of Priority Registration. The Office of the Registrar will not accept registrations prior to 8:00am on the first day of Priority Registration. Undergraduate students eligible to participate in Priority Registration may register for classes anytime after their assigned registration time slot through the close of all registration at the beginning of the semester. Priority Registration appointments are determined based on the number of earned hours as of the end of the previous semester. Registration may be conducted online through the Student Hub or in person in the Registrar's Office. Extensive research shows that students succeed in online and blended courses when they possess certain capabilities and attributes. Before registering for an online course, please complete a self-assessment to find out if online learning is right for you. For additional Online Learning information please visit the Xavier Online Learning website. Information regarding registration can be found through the Student Hub under "Self-Service". Click on "Student Services" then "Registration" to check your Registration Status. Registration cannot occur prior to a student's assigned time slot. Online registration is conducted through the Student Hub under "Self-Service". Course registration (i.e. course add/drop) functionality is now available. Add and drop courses anytime, anywhere via your mobile device. For more information, visit the Mobile Application website. All undergraduates conducting registration In-Person require an advisor's signature on a completed Registration Form. A class override form must be obtained and signed by the department chair for admission into a closed class or if there is a restriction. The departments disburse the forms. Following the 7th calendar day of the semester all course removals will become a permanent fixture of an academic record and will be displayed as a "W" grade on a transcript. A grade of "W" does not affect a student's GPA. Online changes to a student's schedule is disabled at the start of the Withdrawal period. Beginning with Spring 2016, students may withdraw from a course online through the Student Hub instead of using a paper form. Open Registration begins after the conclusion of Priority Registration. This is open to all students who did not participate in Priority Registration. Late registration begins on the first day of the semester and continues through the 7th calendar day of the semester. Classes can be added and dropped from a student's schedule through the 7th calendar day of the semester with adviser's approval. Classes dropped during this period will have no repercussions on a student's academic record and will receive a 100% refund. A drop/add form is required for course credit to be changed from credit to audit, or vice versa. Course taken as audit do not count toward full-time status for financial aid purposes. Refer to the University Catalog for academic policies regarding courses taken for audit. A repeated course form is required for courses taken in previous semesters in which a students wishes to repeat. The form will ensure that the original course grade is excluded from the student's grade point average. A course can only be repeated 3 times Refer to the University Catalog for academic policies regarding repetition of courses. Permission to exceed maximum course load limits, even if additional hours are being taken for audit, must be obtained from the college dean in writing and can be requested in advance. When written approval is submitted to the office of the registrar in advance of priority registration, the adjustment to the course load will be made by the beginning of priority registration. Please view our University Catalog for more information. 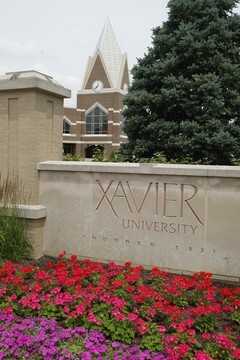 Through the Greater Cincinnati Collegiate Connection (GC3), any student registered at least half-time may register at other schools in the area for courses not available at Xavier, subject to the approval of their college dean. For details about cross-registration, check with the Office of the Registrar.